Tucked away among the majestic oak trees, is Placerita Canyon - a little hidden gem in the community of Newhall located in the Santa Clarita Valley, CA. 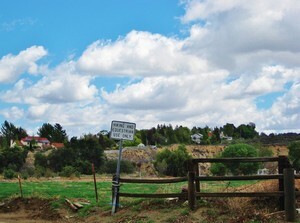 Well Placerita Canyon is not only the current home of the annual Santa Clarita Cowboy Poetry Festival, it is also home to the famous Gene Autry Melody Ranch, where legendary cowboy actors like William S. Hart, Tom Mix, Bill Boyd, Roy Rogers, Gary Cooper, and John Wayne worked and filmed in our own valley. Today modern day city slickers can enjoy a a genteel life style with sprawling modern ranch style homes, large lots, pools, tennis courts. And yes...horses too! Just take a look at the photo to the left indicating that these trails are for hiking and horses! If you are looking for homes in a neighborhood with sidewalks...well, pardner...you'll have to look elsewhere! Even before gold was discovered at Sutter's Mill in 1848 and the 49'ers descended upon the Sacramento Delta, gold was discovered in Placerita Canyon. Legend has it that Francisco Lopez had a dream of floating on pools of gold, while sleeping under an oak tree. 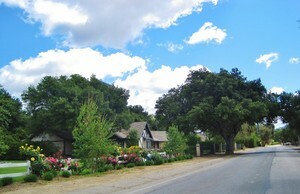 The famous Oak of the Golden Dream is located right here in Santa Clarita Valley! And many folks believe that this area is still golden! For a more historical version of the Oak of the Golden dream, click here. Now Placerita Canyon is home to Placerita Nature Center - a wonderful park for all ages, with many hiking trails, streams, picnic areas, and a nature exhibit, The Master's College, horse lovers, homeowners that want more room to roam, churches, and beautiful homes of all sizes...from cottages to sprawling one story ranch homes, to Mediterranean style homes with red tile roofs, to Tuscan inspired villas nestled under majestic oak trees. Placerita Canyon is minutes to the shops and restaurants and live theaters on Main Street in Old Town Newhall, and a few more minutes to the master planned community of Valencia, but it feels years away! 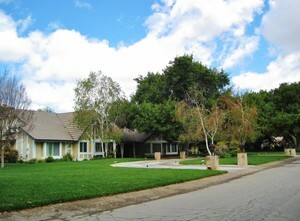 For more information about homes in Placerita Canyon or other parts of Santa Clarita Valley, contact Tricia. 661-259-6154.